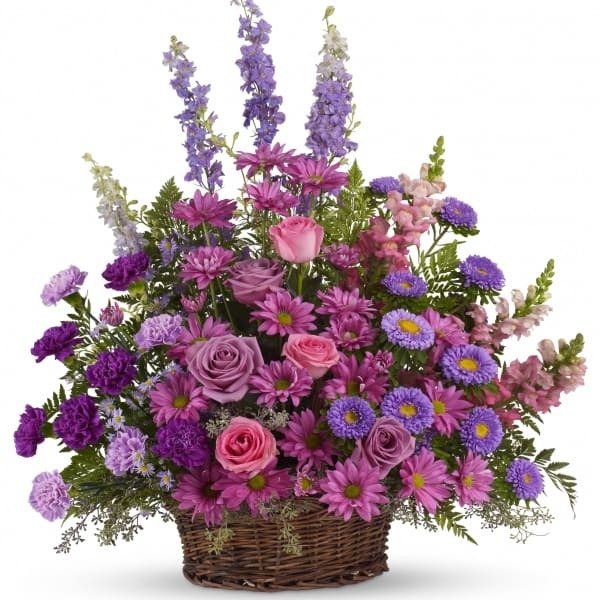 • A profusion of purple, pink and lavender blooms such as roses, carnations, larkspur, matsumoto and monte cassino asters and much more are delivered in a round wicker basket. 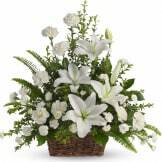 • This arrangement measures approximately 24 1/2" W X 28" H.
Flowers will be received by a Wallace-Thompson Funeral Home's staff. The service was exceptionally prompt and I was told the flowers were beautiful. I didn't make the funeral services but my sister sent me a picture of the flowers and told me too how beautiful they were. Thank you. Flowers were beautiful and the family loved them! Thank you! The flowers were absolutely beautiful! Even more lovely than the picture. I called and placed an order for this and the woman I talked to was so friendly and extremely helpful. I loved how quickly they worked and the flowers were absolutely beautiful. I also appreciated the confirmation email when it was delivered. Thank you for making this experience so easy. Will use again. We we so very pleased with the basket . . . it was just awesome. Thank you for making a choice so easy. Unable to be at the funeral I was very pleased to hear the arrangement was stunning. Thank you for taking care of everything. The Gracious Lavender Basket was so beautiful! I have many years in the floral business and have gotten several things that did not measure up from some florists. I was very happy to see the quality and quantity of this basket arrangement. You will not be disappointed! 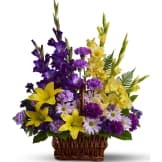 All of our flowers are designed and delivered by hand from a local florist in in Rusk.